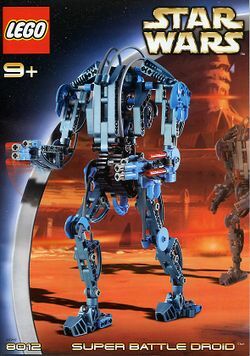 8012 Technic Super Battle Droid is a Star Wars TECHNIC set released in the year 2002, containing a large model of a blue Super Battle Droid. The Super Battle Droid's arms and legs are completely posable, and has two blasters on each arm, as opposed to the actual Star Wars movie, in which many of the Super Battle Droids possess only one pair of blasters, usually on the right arm. The right arm can be controlled from the back of the model, and can be made to extend the blasters from the arm as the arm is rotated. The set does not have a mechanism to spring open like the 8001 Technic Battle Droid does, as the Super Battle Droids were not designed to fold into a compact size for storage. B2 Super Battle Droids were a part of the CIS (Confederacy of Independent Systems) military, introduced at the end of Star Wars Episode II: Attack of the Clones, where they were released on Geonosis to help destroy the Jedi that had come there from Coruscant under Mace Windu. They were equipped with a strong, bulky exterior which made them difficult to take down, as well as a repeating blaster on their arms, and some were equipped with rocket launchers in addition. Unlike Battle Droids, they were not designed to fold up, so they took up much more space in storage. They were tough in combat, but vulnerable at close range. Some appear to have been taken down by clones by holding them and shooting them in their chest. Facts about "8012 TECHNIC Super Battle Droid"